The European Securities and Market Authority (ESMA) calls for EU Regulations to include crowd finance by issuing an Opinion (Reference: 2014/1378) and Advice (Reference: 2014/1560) whitepapers. The goal is too assist NCAs and market participants, and to promote regulatory and supervisory convergence. 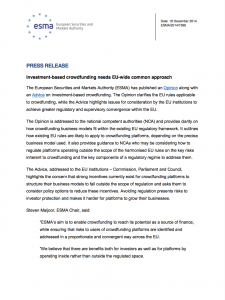 ESMA has assessed typical investment-based crowdfunding business models and how they could evolve, risks typically involved for project owners, investors and the platforms themselves and the likely components of an appropriate regulatory regime. ESMA then prepared a detailed analysis of how the typical business models map across to the existing EU legislation, set out in sections 1 to 6 of the Advice document. Crowdfunding is relatively young and business models are evolving. Crowdfunding opens a gateway for startup and emerging growth companies to tap ‘the crowd’ to raise finance for projects and businesses by means of an internet-based registered platforms through which business or project owners ‘pitch’ their idea to potential backers, who may accredited or non-accredited investors. ESMA’s focus is on crowdfunding which involves investment, as distinct from donation, non-monetary reward or loan agreement. Within investment-based crowdfunding a range of different operational structures are used so it is not straightforward to map crowdfunding platforms’ activities to those regulated under EU legislation. EU financial services rules were not designed with the industry in mind. Member States and NCAs have been working out how to treat crowdfunding, with some dealing with issues case-by-case, some seeking to clarify how crowdfunding fits into existing rules and others introducing specific requirements.